Splash out and go to town when you play this fast-paced shopping themed slot which gives you the chance to live out your wildest shopping fantasies. No need to worry about not being able to find the right size – with bountiful free spins, frequent wilds and scatters, and no maximum win, you are sure to find this shopping spree puts a smile on your face! This is the perfect slot for wannabe big-spenders and self-confessed shopaholics! Bargain hunter aficionados are used to hunting out the biggest discounts and your well-trained eyes will be put to good use in this play newest slot games. Scour the screen for the best discount labels, cast your eye over the new-in trends, and refuel after your spree with a nice cuppa! Eyecon is a Brisbane based gaming developer that has been operating since 1997. They were recently acquired by the tech giant, Play Tech. Eyecon’s expertise is spread across online and land-based gaming, so unlike some other developers, they don’t strive to produce ground-breaking slots that do something wildly different. However, there is something pleasing about the simplicity and old-school fun of their games. 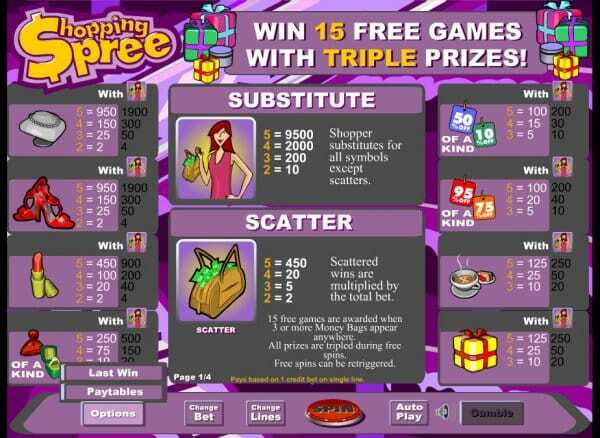 Indeed, the cheerful design and vibrant pink colour scheme of Shopping Spree holds its own charm, and this slot includes some excellent in-play features! If you enjoy Shopping Spree, Eyecon have a similar game – Make Over Magic – which is also well worth a try! For something a bit different, you should give Imperial Destiny a go. If you love promo's, visit Slotsbaby today. This 5 reel 25 payline slot offers the chance of some big wins, and is even more enticing thanks to its frequently occurring free spins, scatters, and wilds! An autoplay feature allows you to sit back and window shop as the computer takes up to 20 spins for you. Free spins – three handbags full of money on screen at any time allow you to take up to 15 free spins! With any luck, you really will bag a ton of money, as winnings are tripled during these free spins! Wild – the female shopper icon is your wild and can substitute for any other symbol, but even better, line up 5 of them to win 9500x your stake! Players can enjoy a wealth of choice when it comes to the size of their stake – you can choose to bet on 1 to 25 paylines, meaning your total bid range spans from 0.01 to 12.50! 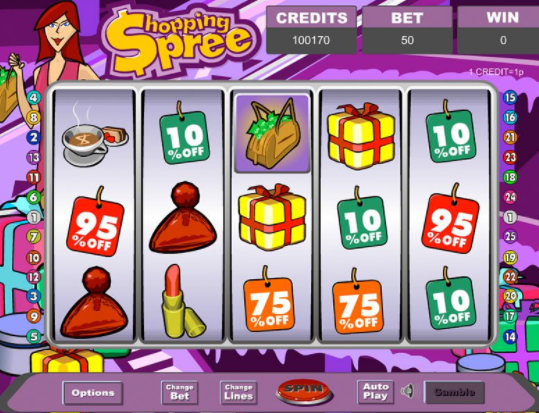 This makes Shopping Spree a great slot for all types of players. The enticing symbols are sure to put you in the mood for a real-life shopping spree, but equally this slot proves good retail therapy in itself. Bag yourself a pair of the glamorous red heels and your favourite shade of lipstick, or head to the sale aisle and collect some discount labels!